If you are in Dubai and have nothing to do and are feeling bored, then head straight to Spring Bamboo Restaurant in Oud Metha, Dubai. Its specialties like sea cucumber with ‘three delicious’, sweet and sour chicken and fried beef with potatoes will certainly help lift up your mood and bring the vibe back as well. This calm and cosy environment bistro basically serves Chinese cuisine that is prepared from fresh ingredients by following traditional recipes. This makes Spring Bamboo Restaurant’s food quite authentic and delicious at the same time. On top of this, folks in Dubai can take pleasure in these delicious dishes without taking any tension about the bill, as Spring Bamboo Restaurant is reasonably priced. - The Spring Bamboo Restaurant has dine-in option for lunch and dinner. - This eatery serves authentic Chinese cuisine. - Guests can order drinks from its menu together with the food. - People can also avail its takeaway service to treat their loved ones with the appetizing food of this eating place. Spring Bamboo Restaurant opens daily for lunch from noon till 3:00 pm and for dinner, 6:00 pm till midnight. Near Mövenpick Hotel, Oud Metha - Dubai - United Arab Emirates. Oud Metha Metro Station 1 is the nearest metro station from Spring Bamboo Restaurant, as it is just 1.4 kilometres away from this bistro, which makes it 18 minutes walking journey. To do so, patrons should head in southwest direction towards 10th Street from this metro station and then continue straight onto 10th Street. Afterwards, at the roundabout, take the second exit and stay on 10th Street to locate the destination just a few metres away. 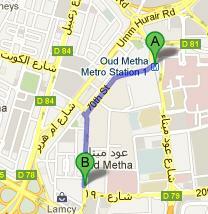 Directions from Oud Metha Metro Station 1 to Spring Bamboo Restaurant. Those who want to use the bus to reach Spring Bamboo Restaurant should take bus number 42 that will drop them at Nasr Leisureland – Dubai bus stop. This station is just 150 metres away from the restaurant, which a bus user can easily cover on foot in about 2 minutes. Bus users need to head on the south course on 10th Street towards 19th Street in order to reach Spring Bamboo Restaurant. 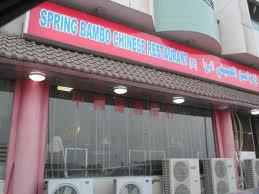 Directions from Nasr Leisureland – Dubai to Spring Bamboo Restaurant.